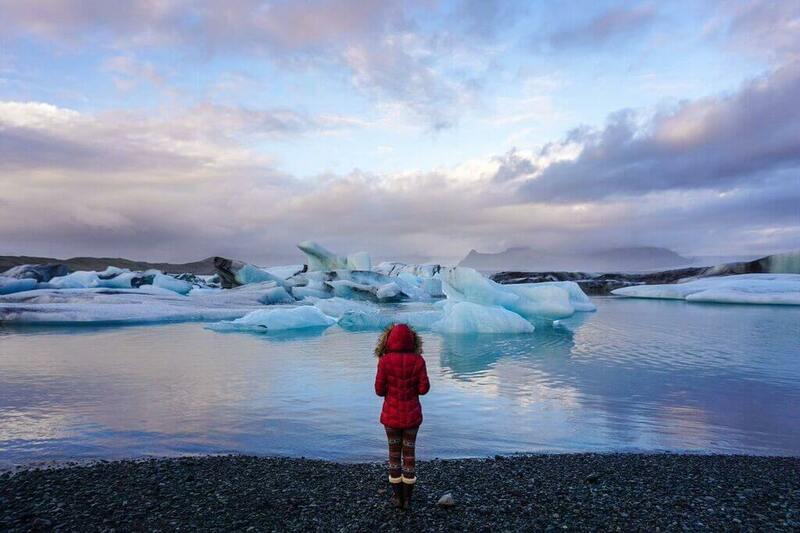 Iceland is a country that can experience several different kinds of weather within one day, or even within one hour! One moment the sun will be shining and the next, you’ll be driving through a storm of hail, wind, and rain. In fact, the wind is so strong, it can blow a car door right off its hinges, seriously! Regardless of the time of year (I went in October), bringing waterproof clothing that can protect you from the wind, and potentially snow and hail, is essential to your comfort while traveling through Iceland. Thankfully, the Gulf Stream keeps Iceland’s temperatures from plummeting much past freezing in the winter but its latitude also means that even in the summer, temperatures don’t get much higher than 50°F/10°C. The great thing about the varied weather is it makes Iceland incredibly green and beautiful. Thanks to the rain, often followed directly after by sunlight, it’s the land of waterfalls and rainbows. Who doesn’t love waterfalls and rainbows? Personally, I’ve never met anyone who doesn’t smile at both. So how do you pack for a place that experiences so many different types of weather in one day? Bring layers, and make sure your clothes are waterproof! A good jacket is the most important thing, apart from good footwear, that you will pack for your trip to Iceland. If you go any time other than the height of summer, chances are good that you will experience freezing temperatures, especially if you head to the highlands, so something warm that keeps out moisture is essential. During my trip, we encountered nearly 48 hours of straight rain and snow, so a jacket that got soaked easily would have been a real drag. I was so glad to have my warm jacket along with me, plus, the red was the perfect color for standing out against the background! I spent €250 on my jacket at a department store in Berlin. Online, it’s only available in Sweden, but here’s a jacket that is almost exactly the same and even a bit cheaper. It comes in black, too! The other item to allot more of your packing budget to is snow boots. These will keep your feet warm and dry, and high-quality ones will stand the test of time, too! I brought two pairs along with me and was glad I did. Though they kept the water out for the most part, that time I was jumping across freezing rivers of water in Landmannalaugar and couldn’t quite clear the water, I dunked my entire leg and was very glad that I had a dry pair of boots back in the camper van. My pairs are wool-lined Ugg Brand Elsa boots, and the pair I’m wearing above are a few seasons old, but are just like Sorel’s version which comes in tons of adorable colors and sizes. 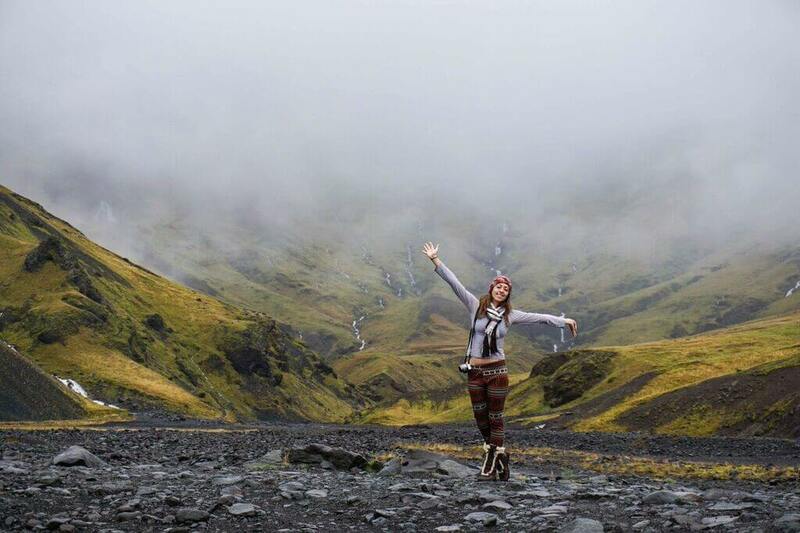 My fleece-lined leggings were perfect for keeping my legs just warm enough for the temperature in Iceland, which was right around freezing for most of the time that I was there in October. Thankfully, they’re also super cheap, so I got several pairs of bright and flashy ones and a few black and blue ones and wore them during the whole trip. You can find a bunch of options here and here. You lose so much warmth through your head, a fleece-lined beanie is a great way to stay toasty and luckily, they’re also very cheap. You can find a bunch of great options in every color here, and patterned ones here. I also keep a pair of rainbow gloves on hand for when night falls. They’re lined with fleece and though I bought mine in the Himalayas in Nepal, you can get a pair here for cheap. The key to staying warm when you hit cooler temperatures then shedding layers when it gets warmer are cheapie, easy thermals that you can mix and match and layer underneath your jacket. One of the coolest things to do while in Iceland is visit the public swimming pools, which are super popular with the locals. Just about every town, no matter how small, seems to have one. They have showers and pools of varying heat up to 104°F/40°C, and are a great way to unwind after a day of adventures. What’s more, you’ll definitely want a suit for your visit to the Blue Lagoon. I bought mine from Black Milk Clothing. Additionally, be sure to bring along a pair of jeans, a thick scarf, lots of warm and thick socks, ample undies, lots of thin, long-sleeved shirts to layer, a few pairs of normal leggings to layer or wear on their own it case it’s a bit warmer during the day, and a camera bag with a waterproof sleeve. I didn’t bring mine and really wished I had! I’m in love with those leggings! In fact I just went to snoop around the internet to find a couple of cheap pairs, I hate wearing jeans and those would be perfect in the Finnish winter. Just noticed on the sidebar that you’re travelling to Finland soon, which cities are you going to visit? 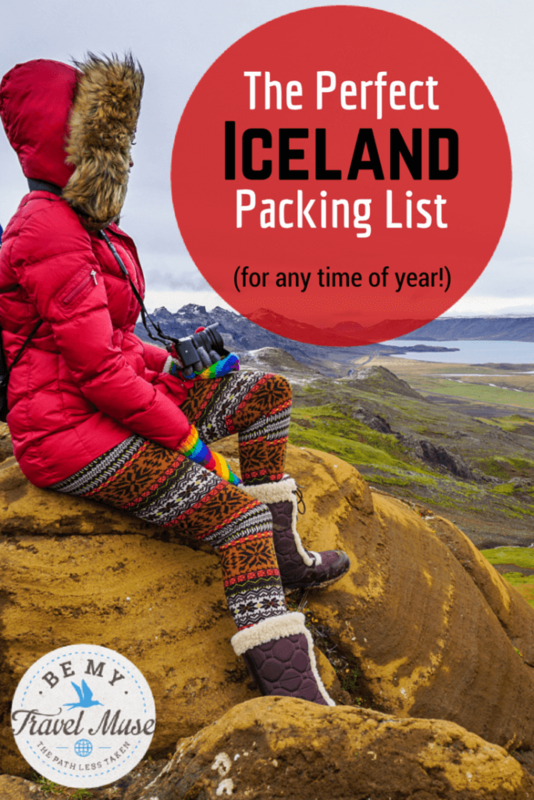 You’re amazing at looking good in winter gear; I’m going to be copying this list if (when) I go to Iceland! Thank you! It’s a whole new world of fashion I never dealt with before but I’m finding wintery places to be awesome. Just have to be dressed right for them. I’m not even thinking of going to Iceland anytime soon but I still read this whole thing through. Just procrastinating. I’m basically drowning in books studying for the FSOT to work in the foreign service. So I’m taking a break to read and re-read your travel adventures to remind myself what it’s all for! Thanks for the inspiration! Aw that warms my heart. Thanks so much and I’m so glad it keeps you motivated. Good luck with your studies! Do you think these same things will be needed for August as well? Or would I be too warm? I’d always pack warmly for Iceland. The weather changes so quickly! Wil this list will work for Auckland New Zealand winters? I’m going in July! Should work for most winter destinations! I’ll be visiting Iceland this August and im stoked, however im still a bit puzzled on what I should pack. Can you confirm that, even during summer, the weather is wild and can go through drastic changes? Also, would you be able to tell me what the average price is for gasoline? Safe travels from a fellow Southern Californian. I only ever found one kind of gas there and don’t recall it being that expensive, but that was in October and a few friends who had been the year before experienced double the price so I can’t be sure what it’ll be for you in August. Yes, be prepared for any kind of weather! I thought that in Iceland there is only glaciers. But even there you can swim! We are visiting Iceland in june- very excited? How does the access to the camp sites work- do we need to buy an access card/book in advance before leaving on our trip? will be great to hear from you. I didn’t book in advance but June might be more crowded so might want to look into it. The campsites will be open, charging, and more crowded then. Thanks for the great article! I live in NE Florida and am a little stumped about what to pack. Sure it gets cold here, but we don’t have snow boots lying around and I’d rather not invest too much money in this that I could spend on the trip! Do you think I can improvise by bringing my snowboarding jacket (http://bit.ly/29UPbxr), snowboard pants, LL Bean boots (6 inch), my steel-toed boots from work for hiking and lots of leggings and thinner tops for layers? I carry a backpack when traveling. I think that should all work. The main thing is you just want it to be waterproof, and layers always help so if you’re too cold, add another and if you’re too hot, take one off. So glad i found this list! Fleece lined leggings are the mvps! We are heading to Iceland in October as well, hopefully the weather is good! We have also gone with the campervan plan for more freedom! Goodness! This is marvelous… I’ve been tailing you for such quite a while on Instagram ? I’m at last anticipating going to Iceland next spring. Would you be able to in any case observe northern lights in Spring? Thanks for your great activity on this article. It would behoove you to get there before daylight savings time but possibly! It’s probably a good idea to book in advance because it’s so popular. If it rains it’s still cool because the water is so warm! Thank you for the packing list. Leaving for Iceland on the 31st of december to have a great start of the year (and an Icelandic new years eve). Do you have a reconmendation on where to rent a car? You are an inspiration!! Took your photography class and learned so much from them. 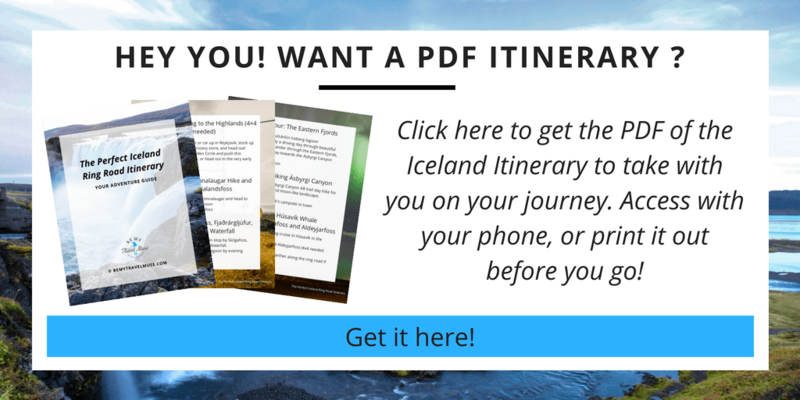 Will be going to Iceland in the summer and used your guide to plan our trip. Thank you!! Amazing! Have such a great time and share your pics! I want to see them!